Naples Real Estate Values on the Rise? I know, I know, I wouldn’t believe a Realtor either if I didn’t see the statistics for myself. 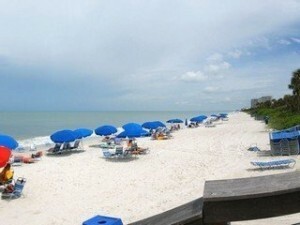 But yes, there are communities in Naples, Florida where home prices have actually increased over the last year. If you listen carefully enough, the statistics are whispering to you that prices may be ready to increase across the board and you will miss the opportunity to buy at prices that may never be this low again. According to Zillow.com, home values in Pelican Bay in Naples, Florida have risen 3.9% year-over-year and 7% quarter-Over-quarter as of May 31, 2010. 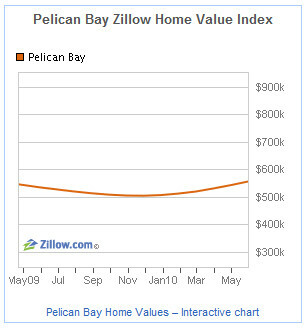 See the chart to the left showing the dramatic upswing in Pelican Bay property values. The increase in Pelican Bay real estate value has a lot to do with sellers. Sellers willingness to slash prices to get sales last summer is a thing of the past. As inventory has dropped and sales have increased, current sellers are holding strong. They are not willing to drop their prices as much to make a sale. Seller stances like this are one of the first signs of a bottom in the market and a brighter future for the entire Naples real estate market. At White Sands Realty, we have also seen increasing values in new home communities like Marbella Lakes where home buyers have seen an increase of over 6% in home values over the last year. As more and more communities in Naples like Pelican Bay and Marbella Lakes see small increases in value, Naples real estate as a whole will begin to turn the corner to recovery – if that hasn’t started already. “According to Zillow, home values in Pelican Bay have risen 3.9% year-over-year and 7% quarter-Over-quarter as of May 31, 2010.” I think in coming day the home value more is more rising….